He stalked into the supermarket in a pair of shorts, their worn fabric, barely visible between his heavy gut and chunky thighs, like a rag stuffed into a corner of a couch. Stopping in front of the line of registers, he looked up at the aisle signs. Shoppers described caution-sized arcs around him, their dark winter coats in stark contrast to his smooth pale skin. I continued placing boxes of tea on the shelf. There is no door policy for a supermarket. One of the games I played to pass the time was to assign weirdness ratings to customers. Wearing only shorts on one of the coldest days of winter was a seven: moderate oddness promising further peculiarities. The man continued to stand like a latex statue at a modern art museum. About 40 years old, he had a broad, oddly faceted face – the planes of his forehead, cheeks and chin bluntly moulded as if from plasticine. Suddenly he lurched forward into aisle 9 (dog food, cat food, tissues, toilet rolls) and I abandoned my boxes of tea to follow him. His stomach lunged and rolled as he paced along scanning the shelves. When he paused in front of the cleaning section I stooped to rearrange packets of Omo. The man removed a mop from a rack. He hefted it, testing its weight, before continuing to the end of the aisle. In the next aisle (Baby and Home) he stood before the tape selection, his bare feet splayed across the scuffed linoleum. After rejecting Scotch and masking tape he took a roll of duct tape. I was no longer pretending to stack shelves. The man was oblivious to anything apart from his mission. I revised his weirdness rating to eight: too interesting to miss. In aisle 3 (cooking oils, pasta, cooking implements) he stopped in front of the pots, pans and cutlery. Tentatively he picked up a knife – a Santoku chef’s knife with a seven inch blade – before quickly returning it to the rack. He stood for another minute before selecting a slender Wiltshire fruit knife with a four inch blade and white, plastic handle. The man examined the blade closely, as if trying to sharpen it with his eyes. It was only then I realised there was nobody else around. At times like these there was never anybody else around. Customers and staff always melted away at the faintest whiff of the unusual. The man twisted the mop head from the handle and threw it to the floor like a severed head. He tore off a length of tape and bound the knife to the mop’s shaft. I should have run, alerted management, called a Code Blue. But I didn’t. This was life – weirdness at a level 10 – and I was the only one here to witness it. He lofted the spear in his right hand, gazing up at it with a look of stern satisfaction. Suddenly he turned to me, eyes piercingly intent, and I stumbled back against the shelves. His eyes continued over me to the end of the aisle. 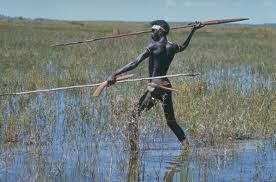 He walked stealthily in a sideways sidling motion, spear raised, crossing one leg in front of the other. As he passed I smelt his sweat, sharp and briny, despite the cold. He continued to the end of the aisle and turned left. I breathed again. I should have gone the other way, headed for the safety of the staff room. But after a moment to ponder the beat of my heart I followed him to the end of the aisle. Peering around a display of corn chips I saw him 20 meters away stalking across the empty supermarket between the fridges and aisles, the spear held steady above his head. His movements grew even slower. Crouching, he moved like a traditional dancer miming the hunt. He seemed completely alert, completely alive. He took a step, then one more, before coming to a rigid halt. He held the posture for an agonisingly long time before, in a single clean motion, he hurled the spear low and hard. I stepped out from behind the shelf to get a clear view. The handle of the mop was sticking from a fridge at a forty-five degree angle. The man removed the spear and with a triumphant roar raised a bloodied side of beef above his head, shaking it like a macabre standard. The PA system clattered to life, ‘Code Blue in the meat department, Code Blue’. The man removed the meat from the spear, grinning wildly and letting out a long raw howl. Dropping the bloodied spear, he strode towards aisle 10 (plates, napkins, barbeque equipment). This story was first published in NMIT’s Time to Write anthology.